Holy crap! It’s time for another dumb homebuilding idea post. I’ve posted a few other dumb homebuilder ideas in the past and this one stinks, too! It has to do with poor water closet plans. This particular home is under a major renovation complete with room demolitions and some truly magnificent workmanship and high dollar materials throughout. But that’s for another day. I’ve enjoyed watching the progress of this renovation by stopping in from time to time. Progress has been slow but steady. There’s been some major re-building of floors and walls going on here and it’s been no small task. 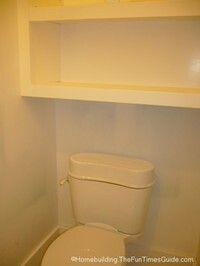 When I was invited to see the water closet in the master bathroom, I immediately thought something was just not right. They’ve built some very nice shelves over the toilet. The problem is that I think the shelves jut out just a little too far. Far enough to bang the back of your head when you take a seat. Maybe I’m picky but I think the shelves should’ve been about 3-4 inches shallower to accommodate a person’s comfort zone for relaxing on the john. Sound stupid? Maybe. I don’t see the point in placing a toilet that far under overhanging shelves when there was room to either place the toilet further out during the plumbing/floor rebuild or make the shelves just a little skinnier. The owners of this home might want to post a sign that reads ‘watch your head on the head‘!